Which Presidential Contender Has the Best Record in the Senate? 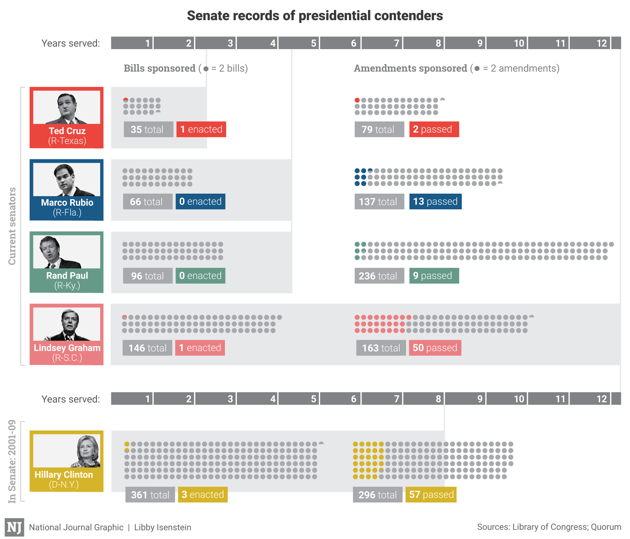 Which of these likely presidential candidates has made the most of their Senate time? Of the likely 2016 presidential contenders, a small handful have served in the U.S. Senate. And what a time they've had. Lindsey Graham has served the longest, sponsoring 146 bills in his 12-year Senate career, with one becoming a law. But newer members Marco Rubio, Rand Paul, and Ted Cruz are well on their way to catching up with the South Carolina Republican. And then there's Hillary Clinton. Though not the only former senator talking about 2016 on the Democratic side—see Jim Webb and Lincoln Chafee—she's certainly leading the Democratic pack. During her eight years in the Senate from 2001 to 2009, Clinton proposed double the number of bills Graham has put on the table, with three being enacted into law. Does three out of 361 sound like a bad batting average? Keep in mind that only 3 percent of sponsored bills proposed in the Senate between 2001 and 2014 (the span of years these senators served) actually became law. This post has been updated to clarify the pool of possible presidential candidates who have served in the Senate.